K’NEX K-FORCE K-10V Building Set Just $8.24! Down From $15! You are here: Home / Great Deals / Christmas Deals / K’NEX K-FORCE K-10V Building Set Just $8.24! Down From $15! Amazon has this K’NEX K-FORCE K-10V Building Set on sale for $8.24 (Reg. $15)! Let your children exercise their imaginations by designing and building their own amazing dart blasters with theK’NEX K-FORCE Build and Blast K-10V Building Set. Your kids will experience non-stop excitement with this set as they build an array of different working models that shoot real darts. The soft foam darts have a total range of 75 feet and are safe for kids to use! The K-FORCE Build and Blast K-10V Building Set includes unique K’NEX rods and connectors, plus special parts for creating different blasters. These parts attach to one another with a satisfying click. This set also includes a quick-fit grip for easy handling and a pre-load ring in a cool, transparent red. 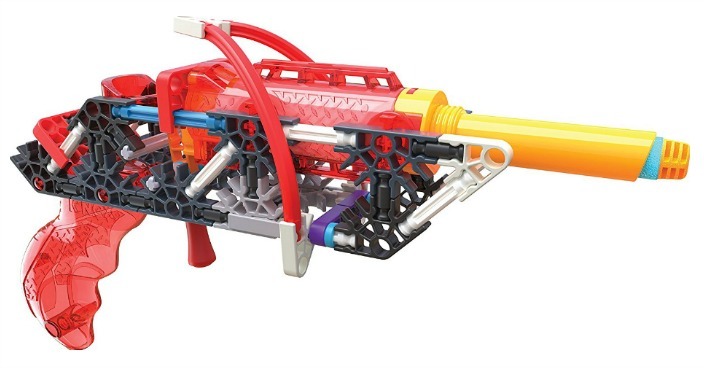 Build and customize this toy blaster and its targets into different designs! Easy-to-follow instructions are available and show each step in creating amazing blasters that really work.